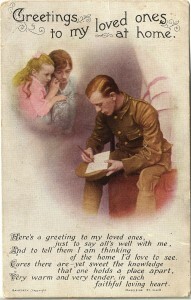 At a time in this country’s history, when some of our service boys and girls, in recent times, were coming home injured from Afghanistan and all too many of them having payed the ultimate price, it is perhaps time for this family to recognise the sacrifice made by it’s earlier generations through two World Wars. It appears to me (Author) that perhaps sometimes injuries and fatalities in current times, do not attract the sympathy they deserve as our military is voluntary as apposed to conscripted. The consensus often being that they knew what they were getting into when they joined up. In both WW1 & WW2 although conscription was used, very many guys volunteered before being called up. Frank Smith (WW1) who is remembered on this site was just such a guy. In WW2 when the youngest Sackett boy (Jack) was called up some of his brothers enlisted immediately with a view to looking after him. So nothing changes and history tells us that we need a good military. Some of our current service personnel have served through Iraq and Afghanistan, not to mention the Falkland Islands & Northern Ireland, which makes them longer servers in theatre than anyone who served in either or both World Wars. Through Hollywood it is easy for war to be glorified and be seen as romantic and exciting, however the reality is dramatically different, whichever side you are on. My Mother worked in the late fifties with a lovely German lady, Martha Hoffman who was cook/house keeper to the Spencer Family in Canterbury. Her Husband was lost on the Russian Front and as a farm worker along with many others had no issues with any other country’s creeds and certainly did not want to go to war but conscription got him. She never received any information on his loss but was always hopeful that one day he would return. She subscribed to a German publication, which listed soldiers being repatriated from Stalin’s Russia and this was in the mid fifties. Many prisoners of war on the Russian Front ended up in work camps, down the saltmines so to speak. 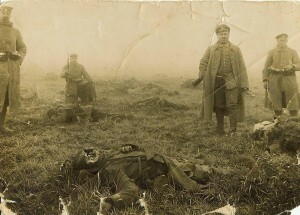 The picture shows members of the Kaisers Army surveying a battlefield after the battle and should leave one in no doubt that war is an ugly and a futile thing no matter what side you are on. The dead are either Belgium or French. I (Author) agonised for some time whether to publish the picture on the website, finally deciding that it was no different to pictures shown regularly by today’s media. There is always the argument that there are just wars and perhaps that’s true, if you consider Adolf Hitler and his Third Reich there was no other way of stopping his horrors. Horrors still go on around the world, with brutal regimes and young females mutilated by perverse religious beliefs. Now that we have pulled out of Afghanistan girls are being educated and allowed to become equal, perhaps the sacrifices of NATO troops will have at least some reward. I’m not optimistic. Having visited (Author) Hanoi in Vietnam in 2012 and enjoyed the hospitality of the people, the wonderful French colonial architecture and the east meets west atmosphere begs the question; was it necessary to carpet bomb it with B52’s? Lyndon B Johnson has a lot to answer for. Having watched Julian Pettifier night after night on the BBC it appeared that Communism had to be stopped but some decades later the Ronald Reagan view that Communism destroys itself, would have been a better policy. Remember he helped orchestrate the downfall of the old Soviet Union (USSR) and the Cold War, without a shot being fired. 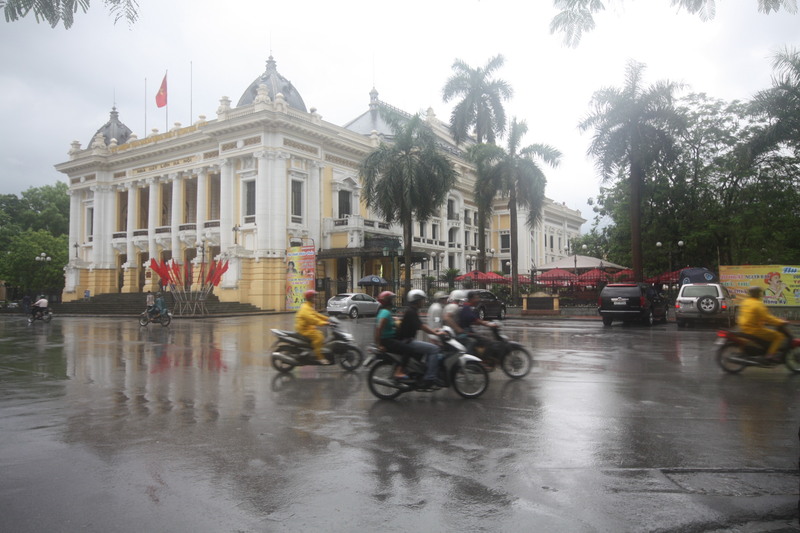 The picture of the Hanoi Opera House with the endless convoy of motor bikes and scooters typifies the culture mix. In starting the initial research it became obvious there were additional areas of interest as each persons life had many facets, which opened up other areas of local and social history. As the website continues to evolve, I’m hopeful, it will prove of interest to a wide audience. Our rural aspect is also continually under threat. With some politicians going into politics without getting any real life skills it would appear that some of our precious landscapes and rural aspect, through rash and poor decisions will be lost. The potential loss is significant as our agriculture/greenbelt land that could be lost forever, which is beneficial to all of us. Unfortunately farms that surround Canterbury are in the hands of either property developers or farming families where the current generation are not interested in farming but sit on valuable assets as Canterbury pushes out beyond it’s current boundary. 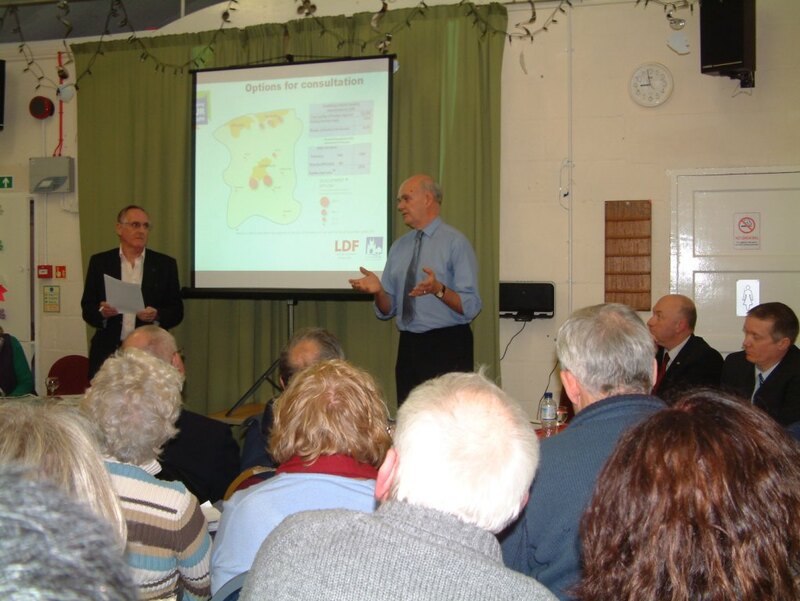 March 2010 – Colin Carmichael, Chief Executive of Canterbury City Council explains the Local Development Framework to Hilltop Residents. Meeting chaired by the Author. Outside the family element we have chosen to add a small amount of history in & around East Kent featuring the coastline and maritime in particular. As the site develops we are always looking for contributions and criticisms, particularly if there are inaccuracies. Please read on and we hope you enjoy the content.